Johnson & Johnson have advised that astigmatism Cyl power of -2.25 is no longer available for powers above -6.00 for 1 Day Acuvue Moist for astigmatism. 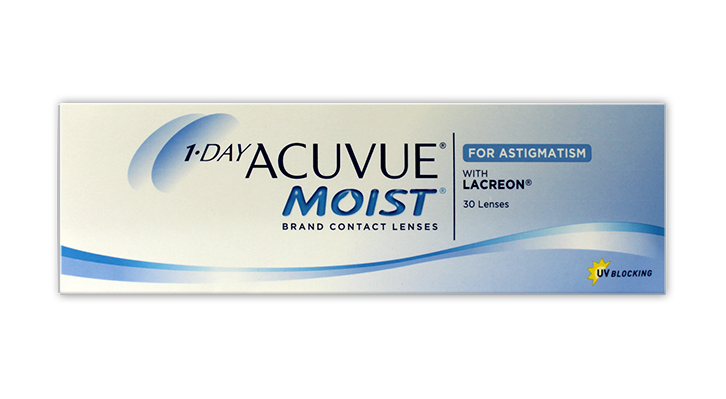 Unfortunately, there is no daily lens replacement available for 1 Day Acuvue Moist for Astigmatism. However, IF your power shows on the drop down list, we still have it in stock, and you can order normally. 1 Day Acuvue Moist for Astigmatism are perfect if you want to experience clear and stable vision, whatever your activity whilst enjoying the comfort, convenience and health benefits of a daily lens. 1 Day Acuvue Moist for astigmatism are designed to correct your eyesight and stay in the right place, whatever you are doing - playing sport, watching TV, working on the computer or driving - thanks to the established technologies of Accelerated Stabilisation Design providing crisp stable vision throughout the day as well as the imbedded Lacreon moisture technology giving great end of day comfort. Feels like i`m not even wearing lenses !!! The most comfortable lens I`ve ever worn !! A bit pricey but i hope to make them available on 90-lens packs !! I just moved recently from Acuvue OASYS for astigmatism to 1 Day Acuvue MOIST for Astigmatism and I noticed how those lenses are thinner , softer and smoother and more wettable than OASYS. They don`t move in the eye at all and they give me great vision they work great for me !! and i work in front of my computer many hours so my eyes do not get dry !! very good lenses !! Have been trying to get a daily lens which suits me for ages and no luck via the optician- ordered these to try and like them so much I have ordered a 3 month supply. I travel a lot so perfect for me, very comfy and good vision. I love these contact lenses, they are so comfortable on! Only downside is that they are expensive, but as I use glasses 9 times out of 10 I do not mind paying a bit extra for contacts.